WASHINGTON, D.C. -- Despite their party controlling both chambers of Congress, only one in six Republicans (16%) approve of the job Congress is doing, the lowest yet in 2017. 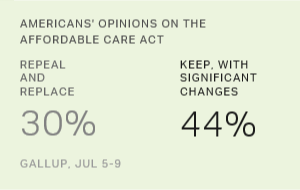 GOP approval has sharply declined this legislative session as congressional Republicans have struggled to repeal and replace the Affordable Care Act. Democrats (12%) are nearly as likely as Republicans to approve of the job Congress is doing. However, unlike Republicans, Democrats have given Congress fairly low ratings throughout 2017, ranging from 10% to 19%. The latest ratings, collected Aug. 2-6, come as Congress goes on recess without delivering an ACA repeal. The legislative body also has yet to reveal plans to fund the nation's infrastructure or reform the federal tax system, among other things. Members are returning home for the recess with little to show for their months in Washington. Half of Republicans rated the legislative branch positively in February, a few weeks into the 115th session -- but this gradually dipped before plateauing around the 30% mark from April to July. The latest rating is a new 2017 low in Republicans' views of this Congress. 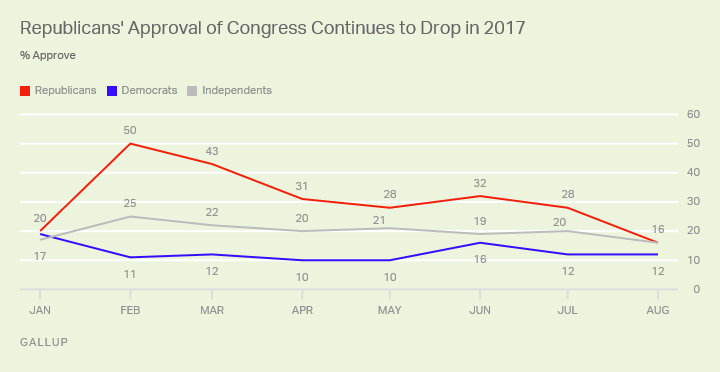 On a national basis, 16% of U.S. adults approve of Congress, statistically similar to the 20% recorded in July but the lowest rating the body has received to date in 2017. This is also the lowest rating Congress has received since the 13% job approval recorded in July 2016. The slight dip in the national rating in August is driven almost entirely by Republicans. Democrats' approval has remained the same, and approval among independents has slipped four percentage points to 16%. Several unsuccessful attempts by Congress this year to repeal and replace the Affordable Care Act did nothing to bolster its already poor image. Some Americans -- in particular, Democrats -- oppose repealing the ACA and likely do not appreciate Congress trying to rescind the healthcare law. Many others, mostly Republicans, are likely disappointed that Congress has been unable to deliver on its long-promised repeal. When members return from recess, they might find their attempts at less contentious measures, such as boosting infrastructure funding, more appealing to Americans -- which could ultimately improve their approval rating. Other controversial issues, such as raising the debt ceiling and adopting spending bills, are unavoidable. Disagreement or inaction on these matters could leave Congress similarly unpopular.